Important Meeting of National League This Week. Argument on Elberfeld Injunction To-morrow. A good deal of interest centres in the special meeting of the National League called by President Pulliam, as on the out-come of it depends the continuance of the peace pact between the major leagues. That the playing of George S. Davis by the New York National League Club, made possible by the permission given the management by President Pulliam, will be the principal matter discussed at the extraordinary meeting goes without saying. Three of the %Western National League clubs have taken a firm stand regarding this action of the League's executive, and possibly two others may coincide with them in the adverse opinion which they have announced as to his right or authority to do so. Opinions differ as to the outcome. Some well-informed persons in both camps say that the almost ruinous war which was waged between the National League and the American League for nearly two years will not be renewed. Others, however, believe that the fight will be resumed and continue(. with more severity and bitterness than before. The wiser heads among those most deeply interested, as well as the Watchful followers and supporters of the game, are of the opinion that neither side is either anxious or able to rekindle the flames which burned so fiercely eight months ago. Nothing, they argue, is to be gained by such an outbreak of hostilities, as a recurrence of the trouble must necessarily mean additional expenditure, a continuance of high salaries for players, and the ultimate wiping out of one or both organizations. Meanwhile the players are not worrying, as they have all to gain and very little to lose so long as the rival camps keep on the ragged edge of an outbreak. At the outset of the present playing season the Presidents of the two big leagues and the President of the National Association of Minor Leagues Instructed their respective corps of umpires as to the enforcement of the stringent rules adopted for the purpose of maintaining order and discipline on the baseball field. The umpires were assured by the executives that they would receive all necessary support in the discharge of their arduous duties, and they began the season by ordering recalcitrant players out of the games and off the fields every time any of the players " kicked " against the official rulings. This severity- had the desired effect for it couple of months, during Which at least four team Captains were ordered off the field and subsequently suspended in addition to a score or more players. When the men saw that the umpires were in earnest and that the reports of these officials were accepted and ratified by the executives, the objections became less frequent and fell to nearly a minimum. " Rowdyism " on the ball field was considered to be pretty nearly ended. while there were no war clouds in sight. But all this seeming quietude was disrupted as soon as the resumption of the war was noised around. The players then began to dispute the decisions of the umpires with impunity. They fought with ,opposing players on and off the field. Managers and Captains of teams became em-broiled in fist fights before thousands of spectators, and to cap the climax a hitherto unheard-of row occurred on the diamond when an umpire so far forget him-self as to strike an offending player, only to be marched off the field in custody of a police official and haled to court the following morning on a charge of disorderly conduct. This row occurred nearly two weeks ago. but neither the umpire nor the Player who provoked him has been called to account for his action. President Ban Johnson. who now is in this city, said yesterday that he had not taken any action in this case up to the present because he had left Chicago the day the disturbance occurred at American League Park, and the umpires report of the affair had gone to his Chicago office. As soon as these papers reach him President Johnson will inflict whatever punishment he deems proper, and. by his action in the case of Pitcher Waddell of the Philadelphia Athletics, It would seem that he intends to punish every offender without any waste of time. Waddell jumped into the grand stand and attacked one of many spectators who were annoying him during a game in Philadelphia Friday and President Johnson suspended him for five days yesterday. 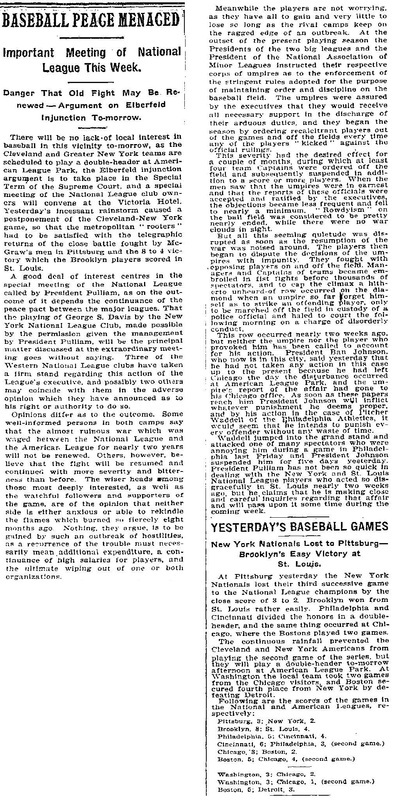 President Pulliam has not been so quick in dealing with the New York and St. Louis National League players who acted so disgracefully in St. Louis nearly two weeks ago, but he claims that he is making close and careful inquiries regarding that affair and will pass upon it some time during the coming week. Brooklyn's Easy Victory at St. Louis. At Pittsburg yesterday the New York Nationals lost their third successive game to the National League champions by the close score of 3 to a Brooklyn won from St. Louis rather easily. Philadelphia and Cincinnati divided the honors in a double header, and the same thing occurred at Chicago, where the Bostons played two games. The continuous rainfall prevented the Cleveland and New York Americans from playing the second game of the series, but they will play a double-header to-morrow afternoon at American League Park. At Washington the local team took two games from the Chicago visitors, and Boston secured fourth place from New York by defeating Detroit. Pittsburg, 3; Now York, 2. Brooklyn, 8: St. Louis, 4.